The OnePlus 5T, a flagship product, packed with great power and speed was launched late last year. Made for the selfie as well as photography enthusiasts the phone cameras provide crystal clear images even under low light conditions. Samsung’s latest offering, the Galaxy A8+, will set new design standards for the Galaxy family. Priced at Rs. 32,990, the phone with an 18:5.9 display and dual selfie cameras will lock horns with OnePlus 5T in its segment. 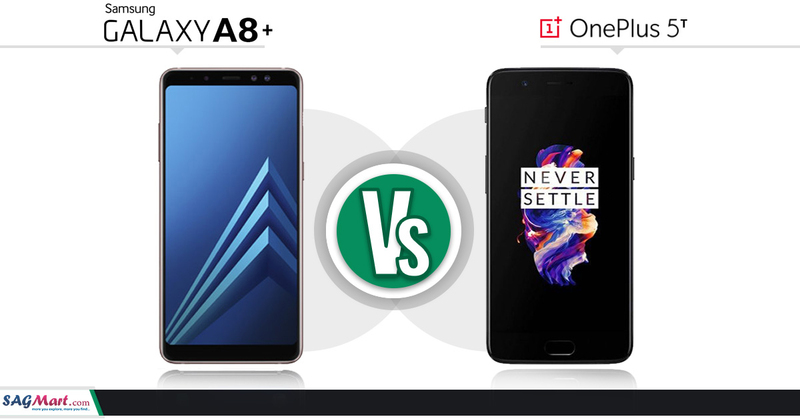 Let’s check out, how these two premium gadgets go up against each other in the overcrowded phone market in India. Both phones come with 16MP front and dual rear camera. However, OnePlus 5T edges out its competitor by supporting 4k video recording with EIS stabilization support. With Galaxy A8+ you can record your precious moments in 1080p only. 6-inches Super AMOLED with 1080 x 2220 pixels whereas OnePlus 5T comes with 6 inches Optic AMOLED 1080 x 2160 pixels. 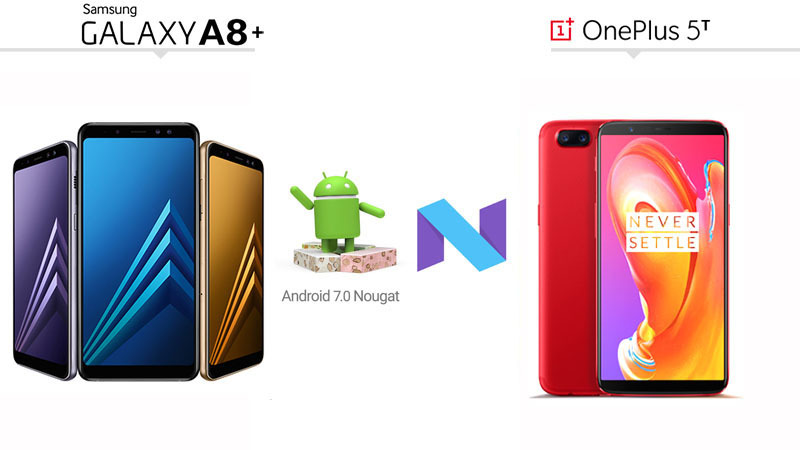 The Samsung Galaxy A8+ has been designed on the lines of Galaxy S8 and Galaxy Note 8. The all glass body caged in an aluminum frame gives an elegant feel as well as strength to the phone.The fingerprint sensor is placed just below the rear camera. 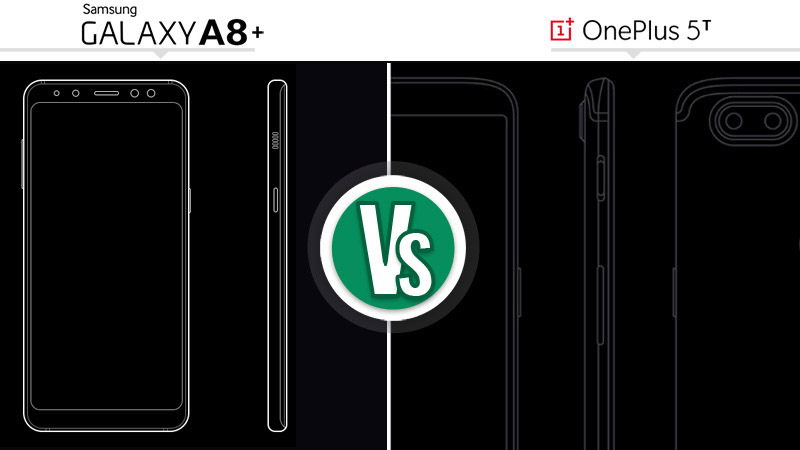 The Samsung Galaxy A8+ edges out its competitor with water and dust protection. 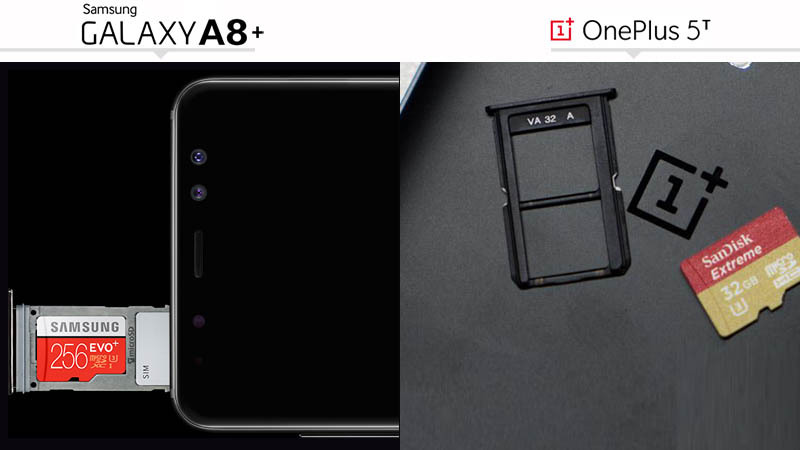 On the right side, Galaxy A8+ has power or lock button and the volume button is on the left side whereas OnePlus 5T has a power button and nano slim slots. Both the phones have similar screen resolutions with little changes in color profile. 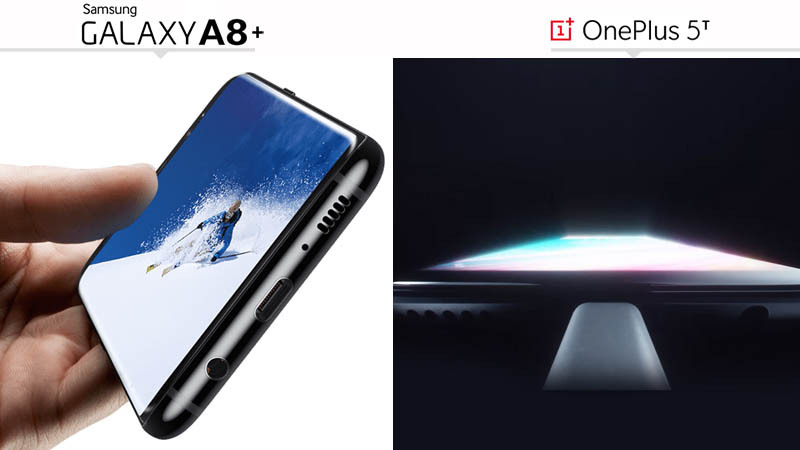 However, the full aluminum body of OnePlus 5T makes it lighter than the Galaxy A8+. Read Also: Huawei Honor 7X Vs Xiaomi Mi A1: Which Is Best For You? Presently, both the phones have Android Nougat 7.1.1 operating system with a possible update to Android Oreo in pipelines. 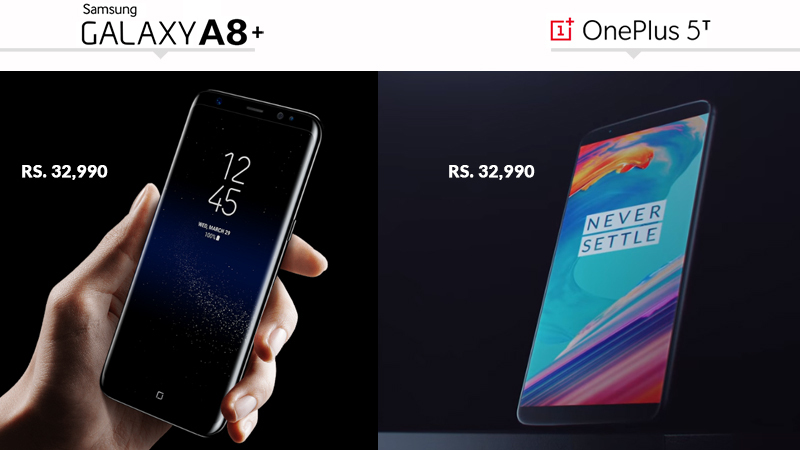 In terms of processing power, OnePlus 5T powered by Snapdragon 835 (Qualcomm’s flagship chipset) and 8GB RAM support clearly outperform Galaxy A8+. Galaxy A8+(2018) comes with 6GB RAM and internal memory of 64 GB, expandable up to 256GB. However, OnePlus 5T smartphone comes in two variants i.e 128 GB, 8 GB RAM OR 64 GB, 6 GB RAM. The 8 GB backed by the strong processor makes it a beast. If you are a gaming addict and prefer multitasking, Oneplus 5T may be your first preference. However, with all sincerity, Galaxy A8+ despite limited RAM would not disappoint either. Samsung has packed in a 3500 mAh faster-charging battery for Galaxy A8+. OnePlus 5t, on the other hand, boasts of a 3300 mAh with dash charging. 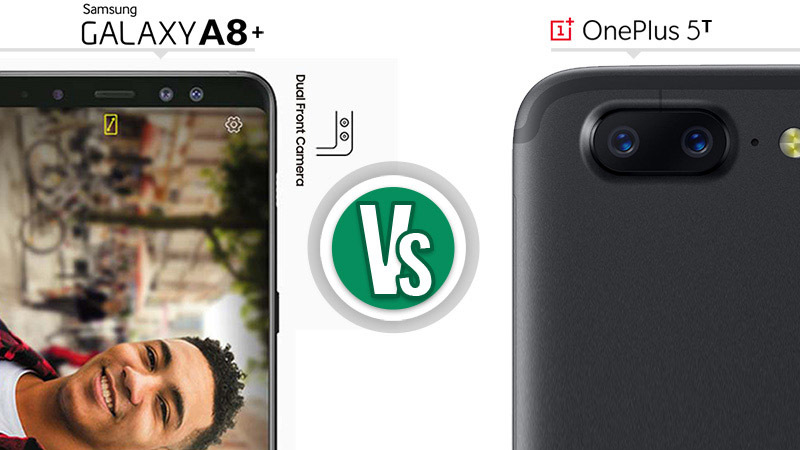 Although the Samsung A8+ may last a little longer the OnePlus 5t dash charging technology negates this hardware advantage of A8+. In terms of connectivity, both phones support the latest USB 2.0 type C reversible connectors processing/transferring data at 480 Mbps. It would be fair to say that unless you are a brand conscious person OnePlus 5t is all in all a good value for money. Samsung does win the battle in terms of design. But with its strong performance coupled with features like dash charging, gives Oneplus 5T a clear edge over its Samsung counterpart. The devices are available exclusively on Amazon.